Gluten Free Watchdog sent the product to an independent lab for testing. The lab tested the oats with the scientifically validated/CODEX Type 1 Method* sandwich R5 ELISA following the oat protocol recommended by the assay manufacturer, R-Biopharm. 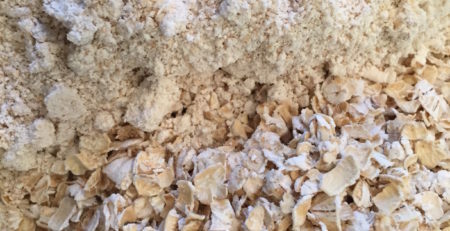 The oat protocol for testing is to homogenize (grind) 200 grams of oats and test 1.0-gram extractions with the cocktail extraction solution. All four extractions tested below the limit of quantification of 5 parts per million of gluten. A portion of the remaining ground sample was sent to a second laboratory. The sample was tested with the sandwich R5 ELISA and cocktail extraction following the oat protocol. The result was below the limit of quantification of 5 parts per million of gluten. Question: Why is the result using Nima “gluten found” while the result using the R5 is < 5 ppm? 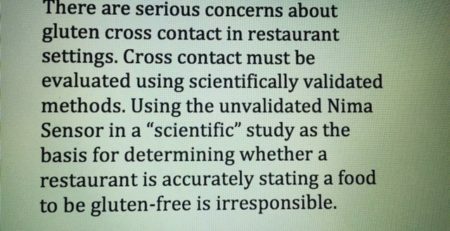 Nima states on their website that if the level of gluten in a sample is below 2 parts per million it will report a “gluten found” result 8% of the time. All four samples tested by the first lab tested below this level. Might the antibody used in the Nima Sensor cross-react with the specific variety of oats in the carton of Quaker oats? To help answer this question, the second laboratory tested the retained sample with the G12 antibody. The G12 antibody and the antibodies used in the Nima device are raised against the 33-mer peptide. This means that these antibodies will detect certain portions of this chain of 33 amino acids. The G12 antibody has known cross-reactivity with some oat varieties. The Nima team states that it is highly unlikely that the antibodies used in the device will show any cross-reactivity with oats. Ten 0.25 gram extractions were tested with the G12 antibody. As was somewhat anticipated, the oats demonstrated low-level cross-reactivity with the G12 antibody. Unfortunately, it is hard to say. Both labs agree that the sample of oats tested does not contain quantifiable gluten. The limit of detection for the Nima device when testing the oat sample could have been < 2 ppm of gluten. The antibody used in the Nima device may have low-level cross-reactivity to the variety of oats in the product. It would be very helpful to test a portion of the retained sample with the antibody used in the Nima device. I can tell you from my experience that Quaker gluten-free oats give me a gluten reaction. Bobs red mill gluten free oats don’t give me a reaction. 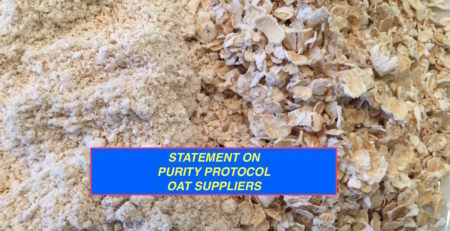 Bob’s Red Mill uses both mechanically/optically sorted oats and purity protocol oats. Do you use the Nima sensor now? After reading this article it seems overly sensitive. 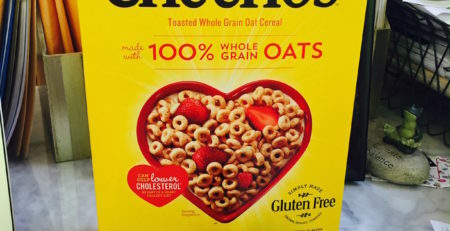 Here is the link to our position statement on the Nima Sensor https://www.glutenfreewatchdog.org/news/gluten-free-watchdogs-position-statement-on-consumer-use-of-the-nima-sensor-to-test-food-for-gluten/.